Most Facebook users dislike changes to their social media page. Sometimes the powers that be let you know it’s coming: : “If you have not changed to….., it will be automatic on July…” This change is so subtle that you may not have noticed it. This is our friend Michele’s page. 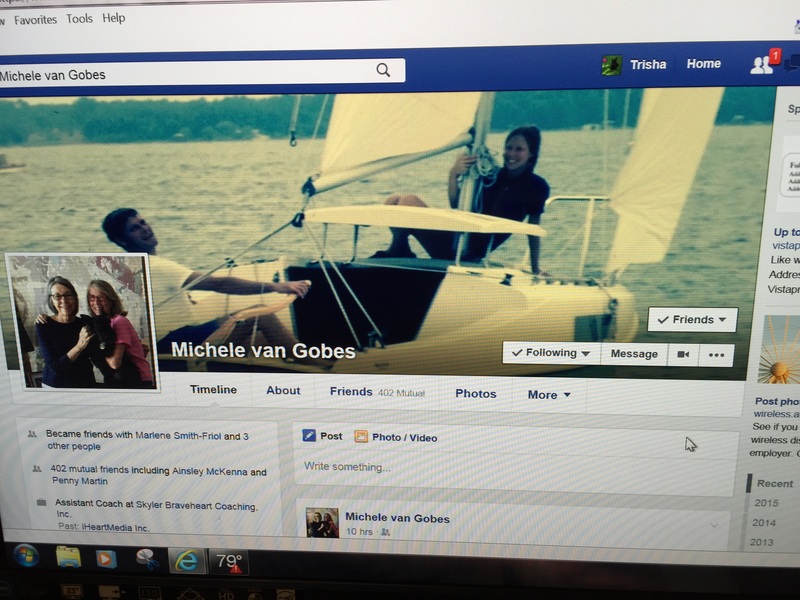 Don’t you love that picture of her on the sailboat? Anyway, the rectangular boxes on the right are undergoing a change. If you click on the Friends box you will see “Get Notifications”, you should check it if you want to see that person’s posts in your news feed. If you ever wondered why you don’t see a person’s posts, this is it. 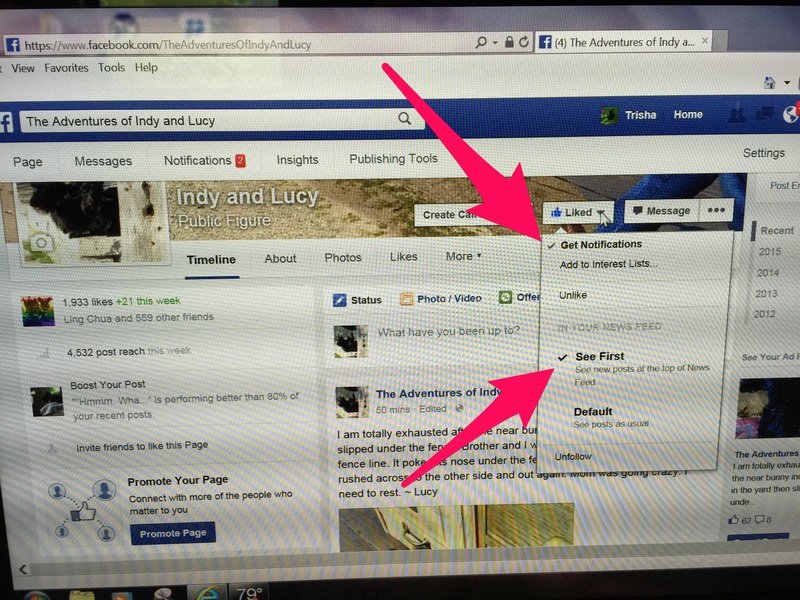 Beneath it are category ratings of who will see your post: close friends, acquaintances, or you can add another list. Mom has a list called Scottie Nation and everyone Scottie is on that one. You can also check more than one category for a person. Look at the box labeled Following. 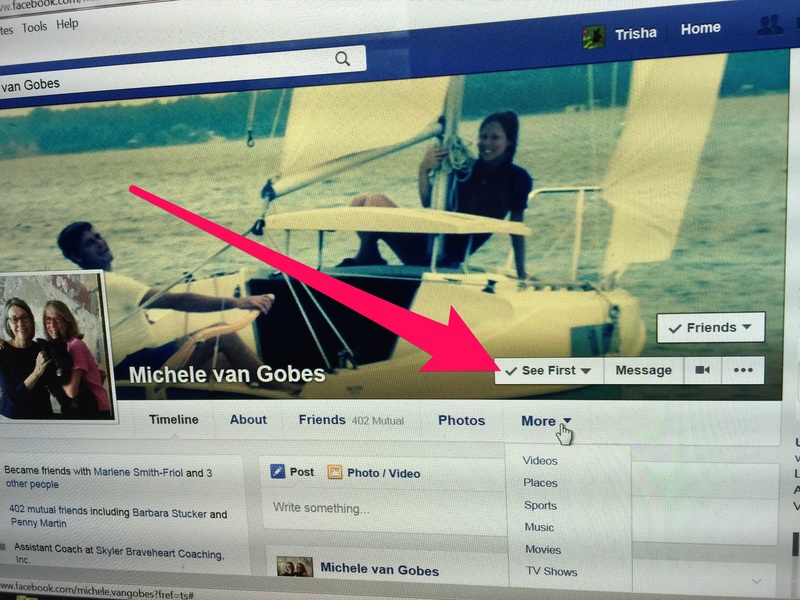 Here is what is new: choices are See First and Default. If you want to be sure to keep up with the latest info a friend posts, be sure to check see first. This is ours: The Adventures of Indy and Lucy. It is public page therefore it operates a little different than a private page. First, you have to LIKE it. Then click on the Liked and you have the new info. Get Notifications and See First need to be checked if you want to see us and we hope you do.